The Swedish retailer has injected new life into a three-year-old campaign, showing that taking a long-term approach to brand-building does pay off. Ikea was the unanimous winner of the Creative Marketer of the Year accolade, which recognises outstanding marketing communications aimed at consumers. The retailer’s body of work is distinctive, emotionally resonant and brilliantly strategic. This is the third year of Ikea’s "The wonderful everyday" campaign, led by country marketing manager Laurent Tiersen, which is bringing real benefits to the retailer and demonstrates how taking a long-term approach to brand-building pays off. In 2016, Ikea had to battle the category’s twin demons of falling consumer confidence and declining mortgage approvals. In order to defend the 0.9% share gain made since the introduction of "The wonderful everyday", the retailer wanted to broaden the campaign to new channels and drive consideration among lapsed audiences. To reach customers in new ways, Ikea opened large-scale stores in new areas and launched the first of its new city-centre concept in Birmingham. The smaller shops aim to straddle the gap between the online and in-store shopping experience. After conducting research that found people were spending less time cooking together, Ikea set up a pop-up restaurant, The Dining Club, in east London in collaboration with Hope & Glory and Drive Worldwide. It allowed people to hold dinner parties for friends with free food and drink. The experience was consistently sold out. Ikea ran some fun social content, including a Skype campaign that challenged customers to find their passports within 30 seconds to highlight the benefits of a well-organised home. It also spoke to people who had organised their storage, encouraging them to share "shelfies". 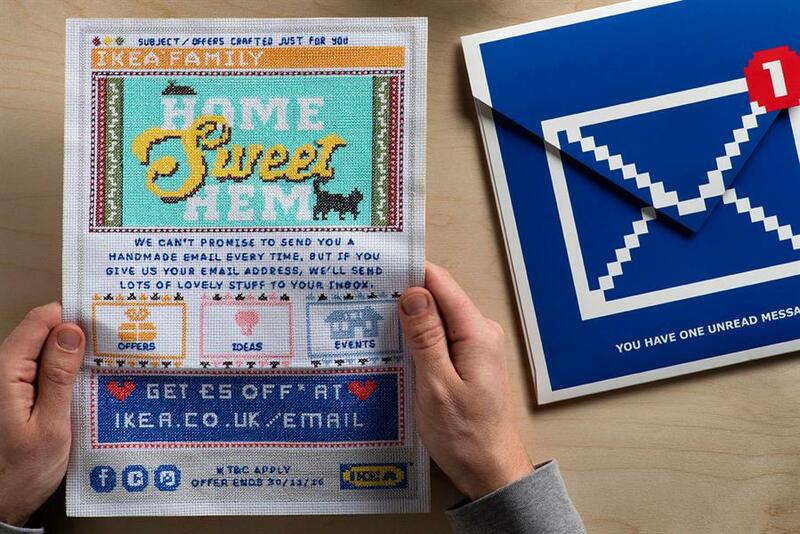 Through Lida, the retailer sent out a cross-stitched mailer resembling an email to encourage customers to opt in to email communications in return for a store voucher. And, of course, Ikea continued to produce beautifully crafted, magical TV spots, through Mother London, that encourage people to elevate everyday moments. Its moving brand ad "Wonderful life" spoke to the over-55s. The spot tracked a couple through key moments in their life together, showing that the little moments were really the big things in life. A nice counterpoint to that was "Cooks", shot by Amélie director Jean-Pierre Jeunet, to show audiences that it doesn’t matter what you cook – it’s making it together that counts. The spot showed a man and his granddaughter cooking together and not taking themselves too seriously. Ikea then targeted Facebook users with recipes designed for cooking together. "Welcome home", launched in October, was another emotional piece. It featured a nurse leaving work in the dark, only to find her path home lit by a series of lamps placed by her son. All of this worked. At the time of writing, Ikea’s sales were up 6% year on year, while ROI also improved. Brand awareness and consideration increased across all age groups. For Ikea’s marketers, it really has been a wonderful everyday. At a time when Procter & Gamble is consolidating and slashing spend on agencies, Unilever’s more sustainable, purpose-driven marketing stands out. The FMCG giant’s marketing leaders, Keith Weed and Aline Santos, launched an ambitious initiative in Cannes to urge the industry to end the use of lazy, harmful stereotypes. It backed up the talk with action, asking all of its agencies and marketers to agree that, when working on Unilever’s products, they would answer ten questions designed to challenge unconscious bias at every stage of the creative process. The results prove that socially responsible marketing can be both effective and creative. In preparation for the initiative, there was the rebrand of Lynx by 72andSunny Amsterdam. It went from outdated ideas about alpha males to encouraging men to celebrate their unique traits. Another example of this approach is the "Love at first taste" campaign for Knorr by MullenLowe London. Instead of targeting one gender, the work was aimed at individuals with a shared interest – a love of cooking and flavour. Unilever also sparked a global conversation with "Free the kids" for Persil, also by MullenLowe London, which publicised the fact that children spend less time outside than a prisoner in a high-security US jail. The pressure to produce the most anticipated Christmas ad of the year must weigh heavy on the shoulders of Craig Inglis’ John Lewis marketing team and their agency, Adam & Eve/DDB. But 2016 was no different to previous years, with the more joyful "Buster the Boxer". Other work during the year centred on fashion with the beautiful "The Edit" campaign. John Lewis understands the value of quality communications. Its IPA Effectiveness Grand Prix win this year is proof for the whole industry that, despite the economically tough market, great creative work still equals business success. Despite parent company Volkswagen suffering a shocking 12 months, under the direction of national communications manager Sarah Cox Audi has been consistently committed to creative marketing and has produced a series of inventive and enjoyable ads that are head and shoulders above the work of its competitors. "Speed isn’t everything", by Bartle Bogle Hegarty, is beautifully crafted, showing a car’s slow-motion turn that formed one of the logo’s circles. Meanwhile, "Everyday extremes" found the Quattro driving around a department store, coping with marble floors, spilt milk and gravel, to demonstrate that Audi’s technology is not just for extreme conditions but relevant for the everyday. It is an imaginative and welcome change from all the bland car advertising around.